In Windows 10 you can quite simply run the command prompt as an administrator in Admin Mode! Some commands can only be run in administrative mode, as these require admin rights to make system relevant changes on / for Windows OS, this example is also for Microsoft Web Server 2016/2012 and some older Windows Operating System! 1.) ... Start the Windows 10 command prompt as an administrator via [Win-Logo] + [X]! 2.) ... Administrator Command Prompt (cmd.exe) via desktop shortcut on theWindows 10 desktop! 3.) ... Start the Windows-10 cmd.exe in administrator mode via Explorer! 4.) ... Start the Windows-10 cmd.exe in administrator mode via new Windows-10 Start! 5.) ... What should you consider when using the command prompt (cmd.exe) as an admin! 1.) Start the Windows 10 command prompt as an administrator via [Win-Logo] + [X]! Please press the key combination [Win-Logo] + [X], then appears at the left side of the Windows 10 desktop a context menu, the so-called win-X menu, here select the Command Prompt (Administrator). Optionally, you can call the Windows X menu in Windows 10 via right-clicking on the Windows logo! 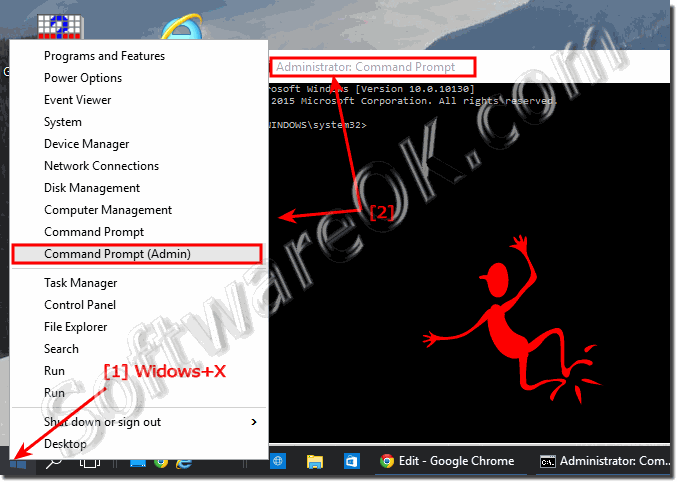 (Image-1) Run Windows 10 command prompt (Admin)! 2.) Administrator Command Prompt (cmd.exe) via desktop shortcut on the Windows 10 desktop! By right-clicking on an empty space on the Windows 10 desktop, the context menu appears, select: "New", "Scho". (Image-3) Command prompt cmd.exe desktop shortcut Windows-ALL! 4.) Start the Windows 10 cmd.exe in administrator mode via new Windows-8 Start (Menu)! To start the command prompt in Windows-8 via new Windows-8 Startmenu, press the key combination[Win-Logo]+[Q] and then enter in the search box cmd! then press the key combination [Ctrl + Shift + Enter] ! That's it;). (Image-4) Run Windows 10 from Windows Start! 5.) 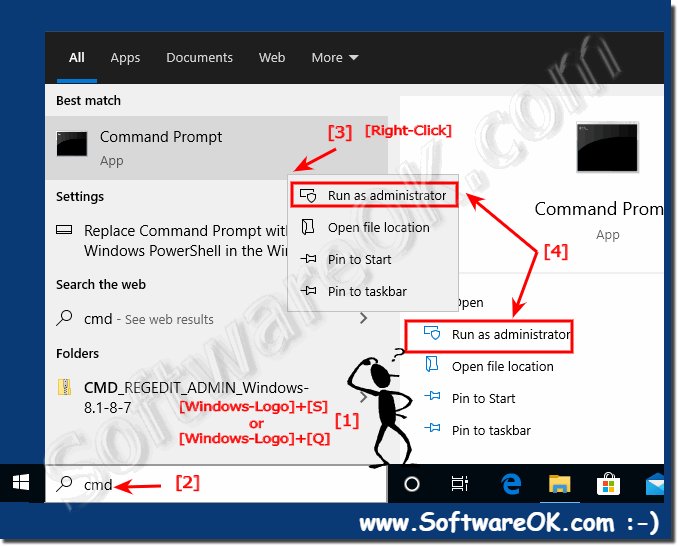 What should you consider when using the command prompt (cmd.exe) as an admin! For system-relevant changes and folders, you as an administrator must start the command prompt so that you receive all rights. In conclusion, you should be very careful with what you do. The system changes can affect the system, which, if badly understood, can lead to system failures. Until the complete system crashes and inoperability of Windows 10. See also: ►►►► A clean installation of Windows 10! Windows-10 - FAQ-57: Run Windows 10 command prompt (cmd.exe) in administrator mode!